BOOK NOW X SEASON 2020 30% DISCOUNTS ON VILLA WITH PRIVATE POOL AND GARDEN NEAR THE SEA. House with all comfort and well-kept garden with private pool and furniture, 4 bedrooms and 2 bathrooms, large living room, large veranda and patio at the back of the house, with several games for adults and children. The beach is at 1,5 km, and 5 minutes from the house. YOU CAN EASILY REACH THE RENTAL PROPERTY, AFTER CAGLIARI, HALF-HOUR TRAVEL BY CAR TO PORT AND AIRPORT. Great spacious vacation home with a well groomed garden comfortable bedrooms spacious enough bathrooms a large enough kitchen but super things are the exterior porch with table and chairs suited for vacation and the outside shower which gives you a sense of enormous freedom. Highly recommended. The owners are exquisite and very discreet but ready for any occasion. Thank you sir. Sergio, you too were perfect tenants. Beautiful villa, equipped with all amenities. I stayed at the villa from June 16 to June 26, 2017. We were 8 people: 4 adults and 4 children + 1 dog. The house is close to the best beaches such as Solanas, Campolongu, Campus, Mari Pintau, and many other beautiful ones. After being in these wonderful beaches we came home to dive into the beautiful pool, pleasant for our children, but also for us adults. The house is well structured and perfect for two families. Equipped with two bathrooms with shower and two additional external showers. There is a large patio where you can have lunch and dine together. Great BBQ area where in the evening we could cook fish. There are plenty of entertainment for everyone: pool, table tennis, table football and large outdoor spaces where to play in the shade. I also like the large garden where we can park our cars inside the house. A wonderful vacation, which exceeded our expectations! 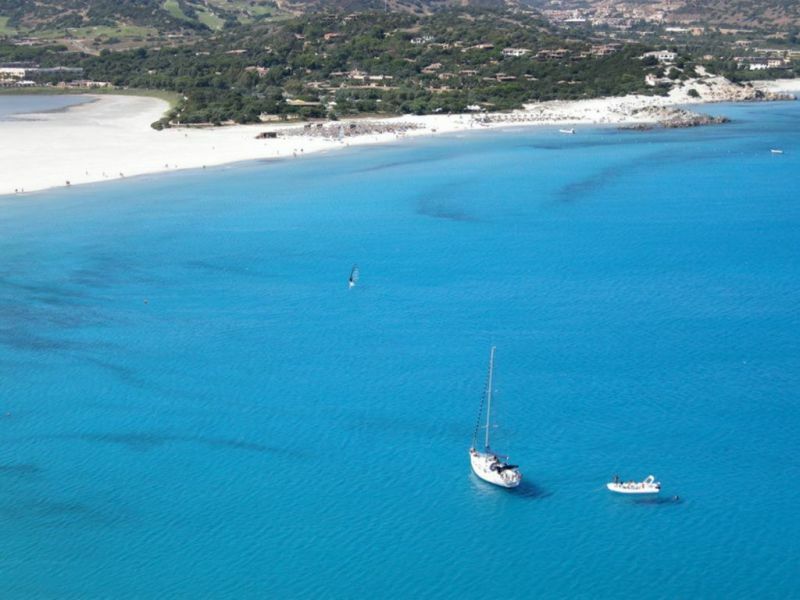 The owners were very welcoming and thank you for welcoming us with the delights of Sardinia and their availability. I recommend this home to everyone !!! Thank you I have found great with you, and then how not to fall in love with your children and the ciuchin, I hope to see you again soon. Villa very well maintained, clean and tidy, comfortable and spacious. We had a very enjoyable week, walking the beach and visits to Villasimius where we witnessed the very nice and fun carnival parade. We go back to the summer safely. Also I give the 5 5 very respectable people. The stay was pleasant; As described, only a small comment on the beds because we were 10 but actually two beds were to be drawn into a small bed for 1 and half and just got this thing got a bit 'confused. However, we have solved positively. For the rest, all very positive and very attentive owner. The rules of recycling that exists in the municipality should be better explained to tenants. Very friendly owners who made us find a fruit basket ns. arrival, and all as shown on the site. We were 10 and we lived in the house in all its corners. The boys had fun with the pool, with deck chairs, with table tennis and more. We parents in the living room outside. The morning breakfast together at the big table in the patio. During the evening, ditto. The house was very clean and well kept. Although it was cold very welcoming and warm. The owners were very helpful and welcoming. Surely we will go in the spring or autumn. The house has been recommended and we will not lose the occasion to advise us as well! Owners very hospitable. Although it was December and it was cold outside we were not bored, so much to see around! Cosy, clean and very well kept. Will definitely be back in the summer, beautiful sea.